Set in the fantasy world of Spira, a setting influenced by the South Pacific, Thailand and Japan, the game's story revolves around a group of adventurers and their quest to defeat a rampaging monster known as Sin. The player character is Tidus, a star athlete in the fictional sport of blitzball, who finds himself in the world Spira after his home city of Zanarkand is destroyed by Sin. Shortly after arriving to Spira, Tidus joins the summoner Yuna on her pilgrimage to destroy Sin. Development of Final Fantasy X began in 1999, with a budget of more than US$32.3 million (US$48.6 million in 2018 dollars) and a team of more than 100 people. The game was the first in the main series not entirely scored by Nobuo Uematsu; Masashi Hamauzu and Junya Nakano were signed as Uematsu's fellow composers. Final Fantasy X was both a critical and commercial success, selling over 8 million units worldwide on PlayStation 2. It is widely considered to be one of the greatest video games of all time. On March 13, 2003, it was followed by Final Fantasy X-2, making it the first Final Fantasy game to have a direct game sequel. Like previous games in the series, Final Fantasy X is presented in a third-person perspective, with players directly navigating the main character, Tidus, around the world to interact with objects and people. Unlike previous games, however, the world and town maps have been fully integrated, with terrain outside of cities rendered to scale. As Tidus explores the world, he randomly encounters enemies. When an enemy is encountered, the environment switches to a turn-based battle area where characters and enemies await their turn to attack. The gameplay of Final Fantasy X differs from that of previous Final Fantasy games in its lack of a top-down perspective world map. Earlier games featured a miniature representation of the expansive areas between towns and other distinct locations, used for long-distance traveling. In Final Fantasy X, almost all the locations are essentially continuous and never fade out to a world map. Regional connections are mostly linear, forming a single path through the game's locations, though an airship becomes available late in the game, giving the player the ability to navigate Spira faster. Like previous games in the series, Final Fantasy X features numerous minigames, most notably the fictional underwater sport "blitzball". Final Fantasy X introduces an overhaul of the summoning system employed in previous games of the series. Whereas in previous titles a summoned creature would arrive, perform one action, and then depart, the "Aeons" of Final Fantasy X arrive and entirely replace the battle party, fighting in their place until either the aeon wins the battle, is defeated itself, or is dismissed by the player. Aeons have their own statistics, commands, special attacks, spells, and Overdrives. The player acquires five aeons over the course of the game through the completion of Cloister of Trials puzzles, but three additional aeons can be obtained by completing various side-quests. As with previous titles in the series, players have the opportunity to develop and improve their characters by defeating enemies and acquiring items, though the traditional experience point system is replaced by a new system called the "Sphere Grid". Instead of characters gaining pre-determined statistic bonuses for their attributes after leveling up, each character gains "Sphere Levels" after collecting enough Ability Points (AP). Sphere Levels allow players to move around the Sphere Grid, a pre-determined grid of interconnected nodes consisting of various statistic and ability bonuses. "Spheres" are applied to these nodes, unlocking its function for the selected character. 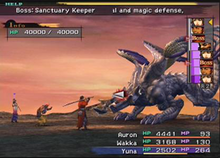 The Sphere Grid system also allows players to fully customize characters in contrast to their intended battle roles, such as turning the White Mage-roled Yuna into a healer and the swordsman Auron into a physical powerhouse. The International and PAL versions of the game include an optional "Expert" version of the Sphere Grid; in these versions, all of the characters start in the middle of the grid and may follow whichever path the player chooses. As a trade-off, the Expert grid has fewer nodes in total, thus decreasing the total statistic upgrades available during the game. Blitzball is a minigame that requires strategy and tactics. The underwater sport is played in a large, hovering sphere of water surrounded by a larger audience of onlookers. The player controls one character at a time as they swim through the sphere performing passes, tackles, and attempts to score. The gameplay is similar to that of the main game in the way that the controlled character moves through the area until they encounter an enemy. In this case, the enemy is a member of the opposing team. Status effects are also implemented in the minigame as each player can learn techniques that are equivalent to abilities in the main game. Blitzball is first introduced in the beginning of the game during one of the early cinematic sequences in which Tidus, the main character who is described as a star blitzball player, is part of an intense game. It is the only minigame that plays a role in the overall plot line as it is not only a main part of Tidus's character, but it's also in the first scene where the game's main antagonist, Sin is shown. Unlike with the other minigames, playing blitzball is mandatory near the beginning of the game, but it is later optional. Final Fantasy X is set in the fictional world of Spira, consisting of one large landmass divided into three subcontinents, surrounded by small tropical islands. It features diverse climates, ranging from the tropical Besaid and Kilika islands, to the temperate Mi'ihen region, to the frigid Macalania and Mt. Gagazet areas. Although predominantly populated by humans, Spira features a variety of races. Among them are the Al Bhed, a technologically advanced but disenfranchised sub-group of humans with distinctive green eyes and unique language. The Guado, which are less human in appearance, with elongated fingers and other arboreal features. Still less human are the lion-like Ronso and the frog-like Hypello. A subset of Spira's sentient races are the "unsent", the strong-willed spirits of the dead that remain in corporeal form. In Spira, the dead who are not sent to the Farplane by a summoner come to envy the living and transform into "fiends", the monsters that are encountered throughout the game; however, unsent with strong attachments to the world of the living may retain their human form. Other fauna in Spira, aside from those drawn from real animals, such as cats, dogs, birds, and butterflies, include the gigantic, amphibious shoopufs (which are similar to elephants); and the emu-like chocobo, which appears in most Final Fantasy games. Spira is very different from the mainly European-style worlds found in previous Final Fantasy games, being much more closely modeled on Southeast Asia, most notably with respect to vegetation, topography, architecture, and names. There are seven main playable characters in Final Fantasy X, starting with Tidus, a cheerful young teenager and a star blitzball player from Zanarkand, who seeks a way home after an encounter with Sin transported him to Spira. To do so, he joins Yuna, a summoner on a journey to obtain the Final Aeon and defeat the enormous whale-like "Sin". Journeying with them are: Kimahri Ronso, a young warrior of the Ronso tribe who watched over Yuna during her childhood; Wakka, a blitzball player whose younger brother was killed by Sin; and Lulu, a stoic black mage close to Yuna and Wakka. During the journey, they are joined by Auron, a former warrior monk, who worked with both Tidus' and Yuna's fathers to defeat Sin 10 years prior; and Rikku, Yuna's cousin, a perky Al Bhed girl and the first friendly person Tidus meets upon arriving in Spira. Tidus waits with his allies outside the ruins of an ancient city. He narrates the events that led to the present, spanning most of the game's storyline. It begins in his home city, the high-tech metropolis of Zanarkand, where he is a renowned blitzball player and son of the famous blitzball star, Jecht. During a blitzball tournament, the city is attacked by an immense creature that Auron, a man not originally from Zanarkand, calls "Sin". Sin destroys Zanarkand and takes Tidus and Auron to the world of Spira. Upon arriving in Spira, Tidus is rescued by Al Bhed salvagers, who speak a language that is foreign to Tidus. One of them, Rikku, speaks the same language as Tidus and reveals that Sin destroyed Zanarkand 1,000 years ago. After Sin attacks again, Tidus is separated from the divers and drifts to the tropical island of Besaid, where he meets Wakka, captain of the local blitzball team, and shows off his blitzball skills. Wakka introduces Tidus to Yuna, a young summoner about to go on a pilgrimage to obtain the Final Aeon and defeat Sin with her guardians Lulu, a mage of black magic, and Kimahri, a member of the Ronso tribe. Meanwhile, Tidus joins to help Wakka in the upcoming blitzball tournament to find a way back home. The party travels across Spira to gather aeons, defending against attacks by Sin and its "offspring" called Sinspawn. After the tournament, they are joined by Auron, who convinces Tidus to become Yuna's guardian. He reveals to Tidus that Yuna's father, Lord Braska; Tidus's father, Jecht; and himself made the same pilgrimage to defeat Sin ten years ago. Tidus thought his father had died at sea ten years earlier. Following another attack from Sin, they are joined by Rikku, later revealed to be Yuna's cousin. When the party arrives in the city of Guadosalam, the leader of the Guado, Seymour Guado, proposes to Yuna, saying that it will ease Spira's sorrow. At Macalania Temple, the group discovers a message from the spirit of Seymour's father, Lord Jyscal; he declares that he was killed by his own son, who now aims to destroy Spira. The group reunites with Yuna and kills Seymour in battle; soon afterward, Sin attacks, separating Yuna and sending the others to Bikanel Island. While searching for Yuna at the island's Al Bhed settlement, Tidus has an emotional breakdown when he learns that summoners die after summoning the Final Aeon, leading to his desire to find a way to defeat Sin while keeping Yuna alive. The group finds Yuna in Bevelle, where she is being forced to marry the unsent Seymour. They crash the wedding and escape with Yuna. The group heads toward the ruins of Zanarkand, seen in the introduction of the game. Shortly before arriving, Tidus learns that he, Jecht, and the Zanarkand they hail from are summoned entities akin to aeons based on the original Zanarkand and its people. Long ago, the original Zanarkand battled Bevelle in a machina war, in which the former was defeated. Zanarkand's survivors became "fayth" so that they could use their memories of Zanarkand to create a new city in their image, removed from the reality of Spira. One thousand years after its creation, the fayth have become exhausted sustaining the "Dream Zanarkand", but are unable to stop due to Sin's influence. Once they reach Zanarkand, Yunalesca—the first summoner to defeat Sin and unsent ever since—tells the group that the Final Aeon is created from the fayth of one close to the summoner. After defeating Sin, the Final Aeon kills the summoner and transforms into a new Sin, which has caused its cycle of rebirth to continue. Yuna decides against using the Final Aeon, due to the futile sacrifices it carries and the fact that Sin would still be reborn. Disappointed by their resolution, Yunalesca tries to kill Tidus' group, but she is defeated and vanishes, ending hope of ever attaining the Final Aeon. After the fight, the group learns that Yu Yevon, a summoner who lost his humanity and mind, is behind Sin's cycle of rebirth. This leads the group to infiltrate Sin's body to battle Seymour, and Jecht's imprisoned spirit. With Sin's host defeated, Tidus' group vanquishes Yu Yevon. Sin's cycle of rebirth ends, and the spirits of Spira's fayth are freed from their imprisonment. Auron, who had been revealed to be unsent, is sent to the Farplane. Dream Zanarkand and Tidus disappear, now that the freed fayth stopped the summoning. Afterward, in a speech to the citizens of Spira, Yuna resolves to help rebuild their world now that it is free of Sin. In a post-credits scene, Tidus awakens under water. He then swims towards the ocean surface, and the screen fades to white. Final Fantasy X's development began in 1999, costing approximately ¥4 billion (approximately US$48.6 million in 2018 dollars) with a crew of over 100 people, most of whom worked on previous games in the series. Executive producer Hironobu Sakaguchi has stated that although he had concerns about the transition from 2D to 3D backgrounds, the voice acting, and the transition to real-time story-telling, the success of the Final Fantasy series can be attributed to constantly challenging the development team to try new things. Producer Yoshinori Kitase was also the chief director of Final Fantasy X, while the direction of events, maps and battles was split up between Motomu Toriyama, Takayoshi Nakazato and Toshiro Tsuchida, respectively. The development of the script for the game took three to four months, with the same amount of time dedicated to the voice recording afterwards. Kazushige Nojima collaborated with Daisuke Watanabe, Toriyama and Kitase on writing the scenario for Final Fantasy X. Nojima was particularly concerned with establishing a connection in the relationship between player and main character. Thus, he penned the story such that the player's progress through the world and growing knowledge about it is reflected in Tidus' own understanding and narration. Character designer Tetsuya Nomura has identified the South Pacific, Thailand and Japan as major influences on the cultural and geographic design of Spira, particularly concerning the geographic location of the southern Besaid and Kilika islands. He has also said that Spira deviates from the worlds of past Final Fantasy games in the level of detail incorporated, something he has expressed to have made a conscious effort to maintain during the design process. Kitase felt that if the setting went back to a medieval European fantasy, it would not seem to help the development team advance. While he was thinking of different world environments, Nojima suggested a fantasy world that incorporated Asian elements. Sub-character chief designer Fumi Nakashima's focus was to ensure that characters from different regions and cultures bore distinctive characteristics in their clothing styles, so that they could be quickly and easily identified as members of their respective sub-groups. For example, she has said that the masks and goggles of the Al Bhed give the group a "strange and eccentric" appearance, while the attire of the Ronso lend to them being able to easily engage in battle. Tidus' relationship with his father Jecht was based "stories throughout the ages, such as the ancient Greek legends." This would eventually reveal the key of Sin's weakness and eventual defeat. Final Fantasy X features innovations in the rendering of characters' facial expressions, achieved through motion capture and skeletal animation technology. This technology allowed animators to create realistic lip movements, which were then programmed to match the speech of the game's voice actors. Nojima has revealed that the inclusion of voice acting enabled him to express emotion more powerfully than before, and he was therefore able to keep the storyline simple. He also said that the presence of voice actors led him to make various changes to the script, in order to match the voice actors' personalities with the characters they were portraying. The inclusion of voice, however, led to difficulties. With the game's cutscenes already programmed around the Japanese voice work, the English localization team faced the difficulty of establishing English-oriented dialogue and the obstacle of incorporating this modified wording with the rhythm and timing of the characters' lip movements. Localization specialist Alexander O. Smith noted that they had to keep the localized sound file within the duration of the original Japanese, as longer files would cause the game to crash. He described the process of fitting natural-sounding English speech into the game as "something akin to writing four or five movies' worth of dialogue entirely in haiku form [and] of course the actors had to act, and act well, within those restraints." The game was initially going to feature online elements, offered through Square's PlayOnline service. The features, however, were dropped during production, and online gaming would not become part of the Final Fantasy series until Final Fantasy XI. Map director Nakazato wanted to implement a world map concept with a more realistic approach than that of the traditional Final Fantasy game, in line with the realism of the game's 3D backgrounds, as opposed to pre-rendered backgrounds. As a player of the games in the Final Fantasy series, battle director Tsuchida wanted to recreate elements he found interesting or entertaining, which eventually led to the removal of the Active Time Battle system, and instead, incorporated the strategy-focused Conditional Turn-Based Battle system. Originally, Final Fantasy X was going to feature wandering enemies visible on the field map, seamless transitions into battles, and the option for players to move around the landscape during enemy encounters. Battle art director Shintaro Takai has explained that it was his intention that battles in Final Fantasy X come across as a natural part of the story and not an independent element. However, due to hardware limitations, this idea was not used. Instead, a compromise was made, whereby some transitions from the field map to the battle map were made relatively seamless with the implementation of a motion blur effect that would happen at the end of an event scene. The desire for seamless transitions also led to the implementation of the new summoning system seen in the game. Kitase has explained that the purpose behind the Sphere Grid is to give players an interactive means of increasing their characters' attributes, such that they will be able to observe the development of those attributes firsthand. The developers experienced difficulty with the scene of Tidus and Yuna kissing, as they were not used to animating romance scenes. Visual Works director Kazuyuki Ikumori stated that this was due to the use of 3D models in the scene. Because of the negative response from female members of staff, the scene was remade multiple times. Final Fantasy X marks the first time regular series composer Nobuo Uematsu has had any assistance in composing the score for a game in the main series. His fellow composers for Final Fantasy X were Masashi Hamauzu and Junya Nakano. They were chosen for the soundtrack based on their ability to create music that was different from Uematsu's style while still being able to work together. PlayOnline.com first revealed that the game's theme song was completed in November 2000. As Square still had not revealed who would sing the song, GameSpot personally asked Uematsu, who jokingly answered "It's going to be Rod Stewart." The game features three songs with vocalized elements, including the J-pop ballad "Suteki da ne", which translates to "Isn't it Wonderful?". The lyrics were written by Kazushige Nojima, and the music was written by Uematsu. The song is performed by Japanese folk singer Rikki, whom the music team contacted while searching for a singer whose music reflected an Okinawan atmosphere. "Suteki da ne" is also sung in Japanese in the English version of Final Fantasy X. Like "Eyes on Me" from Final Fantasy VIII and "Melodies of Life" from Final Fantasy IX, an orchestrated version of "Suteki da ne" is used as part of the ending theme. The other songs with lyrics are the heavy metal opening theme, "Otherworld", sung in English by Bill Muir; and "Hymn of the Fayth", a recurring piece sung using Japanese syllabary. The original soundtrack spanned 91 tracks on four discs. It was first released in Japan on August 1, 2001, by DigiCube, and was re-released on May 10, 2004, by Square Enix. In 2002, Tokyopop released a version of Final Fantasy X Original Soundtrack in North America entitled Final Fantasy X Official Soundtrack, which contained 17 tracks from the original album on a single disc. Other related CDs include feel/Go dream: Yuna & Tidus which, released in Japan by DigiCube on October 11, 2001, featured tracks based on Tidus' and Yuna's characters. Piano Collections Final Fantasy X, another collection of music from the game, and Final Fantasy X Vocal Collection, a compilations of exclusive character dialogues and songs were both in Japan in 2002. The Black Mages, a band led by Nobuo Uematsu that arranges music from Final Fantasy video games into a rock music style, have arranged three pieces from Final Fantasy X. These are "Fight With Seymour" from their self-titled album, published in 2003, and "Otherworld" and "The Skies Above", both of which can be found on the album The Skies Above, published in 2004. Uematsu continues to perform certain pieces in his Dear Friends: Music from Final Fantasy concert series. The music of Final Fantasy X has also appeared in various official concerts and live albums, such as 20020220 Music from Final Fantasy, a live recording of an orchestra performing music from the series including several pieces from the game. An odd note; the unreleased/promo CD-R (Instrumental) version of Madonna's "What It Feels Like For A Girl" done by Tracy Young was used in the blitzball sequences. Additionally, "Swing de Chocobo" was performed by the Royal Stockholm Philharmonic Orchestra for the Distant Worlds – Music from Final Fantasy concert tour, while "Zanarkand" was performed by the New Japan Philharmonic Orchestra in the Tour de Japon: Music from Final Fantasy concert series. Independent but officially licensed releases of Final Fantasy X music have been composed by such groups as Project Majestic Mix, which focuses on arranging video game music. Selections also appear on Japanese remix albums, called dojin music, and on English remixing websites. The Japanese version of Final Fantasy X included an additional disc entitled "The Other Side of Final Fantasy", which featured interviews, storyboards, and trailers for Blue Wing Blitz, Kingdom Hearts, and Final Fantasy: The Spirits Within, as well as the first footage of Final Fantasy XI. An international version of the game was released in Japan as Final Fantasy X International in January 2002, and in PAL regions under its original title. It features content not available in the original NTSC releases, including battles with "Dark" versions of the game's aeons and an airship fight with the superboss "Penance". The Japanese release of Final Fantasy X International also includes "Eternal Calm", a 14-minute video clip bridging the story of Final Fantasy X with that of its sequel, Final Fantasy X-2. The video clip was included in a bonus DVD for Unlimited Saga Collector's Edition under the name Eternal Calm, Final Fantasy X-2: Prologue. It was first released in Europe on October 31, 2003, and featured English voice-overs. The international and PAL versions include a bonus DVD called Beyond Final Fantasy, a disc including interviews with the game's developers, and two of the game's English voice actors, James Arnold Taylor (Tidus) and Hedy Burress (Yuna). Also included are trailers for Final Fantasy X and Kingdom Hearts, a concept and promotional art gallery for the game, and a music video of "Suteki da ne" performed by Rikki. In 2005, a compilation featuring Final Fantasy X and Final Fantasy X-2 was released in Japan as Final Fantasy X/X-2 Ultimate Box. Square also produced various types of merchandise and several books, including The Art of Final Fantasy X and three Ultimania guides, a series of artbooks/strategy guides published by DigiCube in Japan. They feature original artwork from Final Fantasy X, offer gameplay walkthroughs, expand upon many aspects of the game's storyline and feature several interviews with the game's designers. There are three books in the series: Final Fantasy X Scenario Ultimania, Final Fantasy X Battle Ultimania, and Final Fantasy X Ultimania Ω. On December 18, 2012 the game was re-released as part of the Final Fantasy 25th Anniversary Ultimate Box release. On September 13, 2011, Square Enix announced that Final Fantasy X would be re-released in high-definition for the PlayStation 3 and PlayStation Vita, in celebration of the game's 10-year anniversary. In January 2012, production of the game had started. Producer Yoshinori Kitase was once again involved in the production of the game, wishing to work on its quality. On February 18, 2013 the first footage of the PlayStation Vita version of Final Fantasy X HD was released, showing off HD models of Tidus, Yuna, Bahamut and Yojimbo. On March 19, it was confirmed that the PS3 version of the game would also include its sequel X-2, and that it would be remastered in HD. The two HD remastered games for the PS3 were released under the title Final Fantasy X/X-2 HD Remaster on a single Blu-ray disc game, and was sold separately on game cartridges on Vita in Japan and sold together in North America, Europe & Australia as a set, with FFX being on a cartridge and FFX-2 being included as a download voucher. Downloadable versions are available for both systems. Square Enix launched an official website for the two HD remastered titles in March 2013. The games contain all the content found in the International version, including Eternal Calm and Last Mission. During the PlayStation China press conference that took place in Shanghai on December 11, 2014, Square Enix confirmed Final Fantasy X/X-2 HD Remaster would be released for the PlayStation 4 in Spring 2015. It was released in North America on May 12, Australia & Japan on May 14 and Europe on May 15, 2015. It included enhanced graphics in full HD (1080p), the option to switch to the original soundtrack and the ability to transfer save files from the PS3 & PS Vita versions. One year later on May 12, 2016, it was released for Microsoft Windows via Steam. It includes an auto-save feature, 5 game boosters, 3 parameter changes, the option to skip FMVs/cinematics, 4K resolution support, audio settings and graphic options. Square expected the game to sell at least two million copies worldwide owing to the reduced PlayStation 2's fanbase, making it smaller than the last three released titles. However, within four days of its release in Japan, the game had sold over 1.4 million copies in pre-orders, which set a record for the fastest-selling console RPG. These figures exceeded the performances of Final Fantasy VII and IX in a comparable period, and Final Fantasy X became the first PlayStation 2 game to reach two million and four million sold copies. In October 2007, the game was listed as the 8th best-selling game for the PlayStation 2. Final Fantasy X sold over 2.26 million copies in Japan alone in 2001, and sold 6.6 million copies worldwide by January 2004. By July 2006, it had sold 2.3 million copies and earned $95 million in the United States (US$118 million in 2018). Next Generation ranked it as the 11th highest-selling game launched for the PlayStation 2, Xbox or GameCube between January 2000 and July 2006 in that country. As of March 2013, the game had shipped over 8.5 million copies worldwide on PS2. As of 2017, the PS2 version of the game has sold over 8 million copies worldwide. The "Ultimate Hits" bargain reissue of the game in September 2005 sold over 131,000 copies in Japan by the end of 2006. In October 2013, Square Enix announced Final Fantasy X and its sequel Final Fantasy X-2 have together sold over 14 million copies worldwide on PlayStation 2. Final Fantasy X received critical acclaim by the media. The Japanese video game magazine Famitsu and Famitsu PS2 awarded the game a near-perfect 39/40 score. Another Japanese gaming magazine, The Play Station, gave the game a score of 29/30. Famitsu, Famitsu PS2, and The Play Station expressed particularly favorable responses toward the game's storyline, graphics, and movies. The game maintains a 92 out of 100 on Metacritic. Producer Shinji Hashimoto stated that the overall reception to the game was "excellent", having received praise and awards from the media. IGN's David Smith offered praise for the voice actors and the innovations in gameplay, particularly with the revised battle and summon systems, the option to change party members during battle, and the character development and inventory management systems. They also felt that the game's graphics had improved on its predecessors in every way possible, and that the game as a whole was "the best-looking game of the series [and] arguably the best-playing as well". Greg Kasavin of GameSpot praised the game's storyline, calling it surprisingly complex, its ending satisfying, and its avoidance of role-playing game clichés commendable with Tidus viewed as an appealing protagonist. He also lauded the music, feeling it was "diverse and well suited to the various scenes in the game". Similarly, GamePro described its character building system and battle system as "two of the best innovations in the series". The visuals of the game were commended by GameSpy's Raymond Padilla, who referred to them as "top-notch", as well as giving praise to the character models, backgrounds, cutscenes, and animations. The voice casting was praised by Game Revolution who noted most of them were "above average" and called the music "rich". Edge rated the game considerably lower, criticizing many aspects of the game for being tedious and uninnovative and describing the dialogue as "nauseating", particularly panning Tidus. Andrew Reiner of Game Informer criticized the game's linearity and that players were no longer able to travel the world by chocobo or control the airship. Eurogamer's Tom Bramwell noted that the game's puzzle segments were "depressing" and "superfluous", and that although the Sphere Grid was "a nice touch", it took up too much of the game. The linearity of the game was positively commented on by GamePro who stated that a player would not be required to participate in side-quests or the mini-game to reach the game's conclusion, finding some of them unappealing. Game Revolution complained that cutscenes could not be skipped, some even being too long. Final Fantasy X received the Best Game Award from the Japan Game Awards for 2001–2002. In GameSpot's "Best and Worst Awards" from 2001, it came seventh in the category "Top 10 Video Games of the Year". Readers of Famitsu magazine voted it the best game of all time in early 2006. Final Fantasy X came in fifth on IGN's "Top 25 PS2 Games of All Time" list in 2007 and sixth in "The Top 10 Best Looking PS2 Games of All Time". In a similar list by GameSpy, the game took the 21st place. 1UP.com listed its revelation during the ending as the third-biggest video game spoiler, while IGN ranked the ending as the fifth best pre-rendered cutscene. In a Reader's Choice made in 2006 by IGN, it ranked as the 60th-best video game. It was also named one of the 20 essential Japanese role-playing games by Gamasutra. It also placed 43rd in Game Informer's list of "The Top 200 Games of All Time". 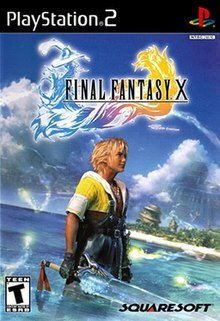 In 2004, Final Fantasy X was listed as one of the best games ever made by GameFAQs, while in November 2005 it was voted as the 12th "Best Game Ever". In a general overview of the series, both GamesRadar and IGN listed Final Fantasy X as the fourth best game. At the sixth annual Interactive Achievement Awards in 2003, it was nominated for "Outstanding Achievement in Animation" and "Console Role-Playing Game of the Year". At the end of 2007, it was named the ninth best-selling RPG by Guinness World Records. Readers from GameFaqs also voted it as Game of the Year during 2001. In 2008, readers of Dengeki magazine voted it the second best game ever made. It was voted first place in Famitsu's and Dengeki's polls of most tear-inducing games of all time. Both Tidus and Yuna have been popular characters in games in general due to their personalities and their romantic relationship. Due to its commercial and critical success, Square Enix released a direct sequel to Final Fantasy X in 2003, titled Final Fantasy X-2. The sequel is set two years after the conclusion of Final Fantasy X, establishing new conflicts and dilemmas and resolving loose ends left by the original game. Although the sequel did not sell as well as the original, 5.4 million units versus over 8 million units, it can still be considered a commercial success. As a result of the title's popularity, Yoshinori Kitase and Kazushige Nojima decided to establish a plot-related connection between Final Fantasy X and Final Fantasy VII, another well-received Final Fantasy game. In 2013, after the release of the HD Remaster, Nojima stated that he would like to see a second sequel to X, and if there were demand for it, it could happen. The minigame of blitzball has made it into other games, such as Final Fantasy X-2, and was mentioned as a possibility for Final Fantasy XIV: A Realm Reborn. The advancements in portraying realistic emotions achieved with Final Fantasy X through voice-overs and detailed facial expressions have since become a staple of the series, with Final Fantasy X-2 and other subsequent titles (such as Dirge of Cerberus: Final Fantasy VII, Final Fantasy XII, XIII and its sequels, and XV) also featuring this development. Traversing real-time 3D environments instead of an overworld map has also become a standard of the series. Final Fantasy X can be considered a pioneer in 3-D RPG maps. According to Square Enix producer Shinji Hashimoto, cosplays of the characters have been popular. Takeo Kujiraoka, director from Dissidia Final Fantasy NT, regarded Final Fantasy X as his favorite game from the franchise based on its emotional impact on the players as well as the multiple amount of playable content that surpasses 100 hours. Kujiraoka noted that the staff received multiple requests by fans to include Tidus' and Yuna's Will look as an alternative design but Nomura said it was not possible as the company would first need to develop Final Fantasy X-3. ^ Japanese: ファイナルファンタジーX, Hepburn: Fainaru Fantajī Ten? ^ a b c d e Square (December 20, 2001). Final Fantasy X International. PlayStation 2. Square EA. Level/area: Beyond Final Fantasy: Producer. ^ a b c Bramwell, Tom (June 16, 2002). "Final Fantasy X Review". Eurogamer. Archived from the original on December 7, 2008. Retrieved November 23, 2008. ^ a b Zdyrko, Dave (November 26, 2001). "Final Fantasy X Preview". IGN. News Corporation. Archived from the original on May 9, 2008. Retrieved December 14, 2008. ^ a b c d Padilla, Raymond (December 15, 2001). "Final Fantasy X Review". GameSpy. Archived from the original on July 15, 2012. Retrieved November 20, 2008. ^ a b c Vestal, Andrew (2003-04-28). "Final Fantasy X". GameSpot. Retrieved 2017-07-24. ^ Tidwell, Mickel. "Final Fantasy X – Review". RPGamer. Archived from the original on June 21, 2013. Retrieved April 6, 2012. ^ a b Clark, James Quentin (October 6, 2008). "Final Fantasy X International". RPGFan. Archived from the original on December 11, 2008. Retrieved November 23, 2008. ^ a b Kasavin, Greg (2001-12-14). "Final Fantasy X Review". GameSpot. Retrieved 2017-07-25. ^ a b c d Square Co (December 20, 2001). Final Fantasy X. PlayStation 2. Square EA. Rikku: We're Al Bhed. Can't you tell? Wait, you're not an Al Bhed-hater, are you? / Tidus: I don't even know what an Al Bhed is. / Rikku: Where are you from? / Tidus: Zanarkand. I'm a blitzball player. Star player of the Zanarkand Abes! / Rikku: Did you...hit your head or something? / Tidus: Um, you guys hit me. / Rikku: Oh, right... Do you remember anything before that? / Tidus [voiceover]: So I told her everything there was to tell about Zanarkand; about life there, blitzball, and Sin's attack...and about how Auron and I were engulfed in this light. ^ a b c d Square Co (December 20, 2001). Final Fantasy X. PlayStation 2. Square EA. Level/area: Besaid. Tidus: We're taking the same boat as Yuna, right? Why do we gotta wait here? / Wakka: Yuna came to [Besaid] ten years ago, when the last Calm started. [...] Since then, she's been like a little sister to me and Lulu. But she had the talent...she became an apprentice. Now, today, she leaves as a summoner. / Lulu: This is our journey. We should leave together. ^ Square Co (December 20, 2001). Final Fantasy X. PlayStation 2. Square EA. Level/area: Besaid. Lulu: Kimahri Ronso, of the Ronso tribe. He's learned the fiends' way of fighting. [...] Wakka: He's another of Yuna's guardians. [...] Yuna: Sometimes we don't understand him either. Kimahri doesn't talk much, anyway. But he has protected me since I was a child! ^ a b Square Co (December 20, 2001). Final Fantasy X. PlayStation 2. Square EA. Level/area: Besaid. Wakka: I'm Wakka, coach and captain of the Besaid Aurochs, brudda! ^ Square Co (December 20, 2001). Final Fantasy X. PlayStation 2. Square EA. Level/area: Besaid. Wakka: My little brother, Chappu. He looked like you [Tidus]. [...] He was with the Crusaders...when they fought Sin last year. He didn't make it. [...] I became a guardian to fight Sin, ya? / Tidus: Revenge, then? / Wakka: That was the idea. But, I'm more worried about a stupid game now than avenging my brother. Well, after the next tournament, I'll be a guardian full-time. ^ a b Square Co (December 20, 2001). Final Fantasy X. PlayStation 2. Square EA. Level/area: Luca. Tidus: Who are you, anyway? You knew my old man, didn't you? / Auron: Yeah. / Tidus: And you also knew Yuna's father? / Auron: That's correct. / Tidus: Hey, man, there's no way. That's just impossible. / Auron: Nothing impossible about it. Jecht, Braska, and I...together, we defeated Sin, ten years ago. Then I went to Zanarkand, where I watched over you, so that one day, I could bring you to Spira. ^ a b Square Co (December 20, 2001). Final Fantasy X. PlayStation 2. Square EA. Level/area: Introduction (Zanarkand). Tidus [voiceover]: Listen to my story. This...may be our last chance. ^ Square Co (December 20, 2001). Final Fantasy X. PlayStation 2. Square EA. Level/area: Zanarkand (Dream). Zanar (Commentator): Ten years later, the Jecht Memorial Cup tournament is today! The two teams that have won through to the finals are, of course, the Abes from A-East, and the Duggles from C-South. I know there's a lot of people out there today to see the star of the Abes [Tidus]! In just one year, he's become the team's number one player! He's Jecht's blood, and the new hope of blitzball! ^ Square Co (December 20, 2001). Final Fantasy X. PlayStation 2. Square EA. Level/area: Zanarkand (Dream). Auron: Look! [...] We called it "Sin". / Tidus: Sin...? ^ Square Co (December 20, 2001). Final Fantasy X. Square EA. Level/area: Al Bhed Salvage Ship. Rikku: Yeah, there is no Zanarkand anymore. Sin destroyed it a thousand years ago. So, no one plays blitzball there. / Tidus: ...Huh?! Wh-What you do mean, a thousand years ago? But I saw Sin attack Zanarkand! You're saying that happened a thousand years ago? No way! ^ a b Square Co (December 20, 2001). Final Fantasy X. PlayStation 2. Square EA. Level/area: Mi'ihen Highroad. Yuna: The Final Summoning. It's the only way to defeat Sin. The only way. With it, we can call the Final Aeon. That's the goal of the pilgrimage. The Fayth of the Final Summoning lies waiting in the far north, to greet summoners [who] complete their pilgrimage. At the world's edge – in Zanarkand. [...] / Auron: She means the ruins of a city destroyed a thousand years ago. ^ Square Co (December 20, 2001). Final Fantasy X. PlayStation 2. Square EA. Level/area: Besaid. Wakka: A major blitz[ball] tournament's coming up. All the teams in Spira'll be there. It's so huge, I'm sure someone there will recognize you! [...] It'll be fun! Whaddaya say, huh? Come on, come on! / Tidus: ...Sure thing. ^ Square Co (December 20, 2001). Final Fantasy X. PlayStation 2. Square EA. Level/area: S.S. Liki. Tidus [voiceover]: I was just fooling myself. Maybe it was that day...on the sea, under the burning sun... I started to give up hope. I was in a foreign world; I wasn't going home. This was my new reality, and I was stuck in it for good. ^ Square Co (December 20, 2001). Final Fantasy X. PlayStation 2. Square EA. Level/area: Luca. Auron: Yuna / Yuna: Sir? / Auron: I wish to become your guardian. Do you accept? / [...] Lulu: But why? / Auron: I promised Braska. [...] And...[Tidus] comes too. / Tidus: Hi, guys. Eh...howdy. / Auron: This one I promised Jecht. ^ Square Co (December 20, 2001). Final Fantasy X. PlayStation 2. Square EA. Level/area: S.S. Liki. Yuna: You're a blitzball player, aren't you? from Zanarkand, right? / Tidus: You...hear that from Wakka? [...] Wakka... Wakka doesn't believe me at all. / Yuna: But...I believe you. [...] I've heard...that in Zanarkand, there's a great stadium, all lit up, even at night. [...] / Tidus: How do you know that? / Yuna: A man named Jecht told me. He was my father's guardian. / Tidus: [to self] J...Jecht...? [out loud] My father... his name is Jecht. / Yuna: Amazing! You know, our meeting like this must be the blessing of Yevon! / Tidus: Sounds like him, but it can't be him. / Yuna: Why not? / Tidus: My old man, he died. Ten years ago, off the coast of Zanarkand. / Yuna: I-I'm sorry. / Tidus: He went out to sea for training one day...and never came back. And no one's seen him since then. / Yuna: Why, that's the day that Jecht came to Spira! / Tidus: Wha – ? / Yuna: It's true! I first met Jecht ten years and three months ago! I remember that was the day my father left. The date fits, doesn't it? ^ Square Co (December 20, 2001). Final Fantasy X. PlayStation 2. Square EA. Level/area: Macalania. Rikku: Well, my dad's sister is Yunie's mother, you get it? ^ Square Co (December 20, 2001). Final Fantasy X. PlayStation 2. Square EA. Level/area: Guadosalam. Yuna: [Seymour]...He asked me to marry him! / Tidus: You serious?! / Auron: [to Seymour] You know what Yuna must do. / Seymour: Of course. Lady Yuna—no, all summoners—are charged with bringing peace to Spira. But this means more than just defeating Sin. She must ease the suffering of all Spira. She must be a leader for the people. I proposed to Lady Yuna as a maester of Yevon. / Auron: Spira is no playhouse. A moment's diversion may amuse an audience, but it changes nothing. ^ Square Co (December 20, 2001). Final Fantasy X. PlayStation 2. Square EA. Level/area: Macalania Temple. Jyscal: Listen to me very carefully, for I shall tell you the truth about my son, Seymour. His mind is closed even to me, a maester of Yevon. But I can feel flames of darkness burning in his heart. He is using Yevon, the Guado, and even the summoners. If he is not stopped, he will surely bring destruction and chaos to Spira. I will leave this world soon, killed by my own son. [...] / Auron: Wonderful. / Rikku: Will Yuna be all right? / Auron: Without us, no. ^ Square Co (December 20, 2001). Final Fantasy X. PlayStation 2. Square EA. Level/area: Macalania Temple. Seymour: Yuna...you would pity me now? [dies] / Tromell: Lord Seymour! What happened here?! / Wakka: What...What have I done...? / Tidus: Wait a minute! It's not our fault at all! Seymour struck first; he's the bad guy! / Tromell: Y-You did this?! / Auron: Yuna. Send him. / Tromell: No, stop! Stay away from him, traitors! ^ a b Square Co (December 20, 2001). Final Fantasy X. PlayStation 2. Square EA. Level/area: Bikanel Island – Sanubia Desert. Rikku: Oh! Hey, guys! Where's Yunie? / Tidus: Gone. / Lulu: Gone... Some guardian I am. / Rikku: Um... There's something I wanna tell you, but promise you won't say anything. [...] I know where we are. We're on Bikanel Island. There's a place us Al Bhed call "Home" here. Yunie's there, I'm sure of it! Other Al Bhed must've come and rescued her! / Wakka: "Rescued"? You mean "kidnapped"! / Tidus: What does it matter as long as she's safe?! / Rikku: That's right! Anyway, I will take you there if you promise that you won't tell anyone about it. ^ Square Co (December 20, 2001). Final Fantasy X. PlayStation 2. Square EA. Level/area: Bikanel Island – Home. Rikku: Summoners journey to get the Final Aeon. Yuna told you, didn't she? With the Final Aeon, she can beat Sin. But then...but then... If she calls it, the Final Aeon's going to kill her! Even if she defeats Sin, it will kill Yunie too, you know! / Tidus: Was I the only one who didn't know...? [...] I can't let her die! I'll find her! ^ Square Co (December 20, 2001). Final Fantasy X. PlayStation 2. Square EA. Level/area: Fahrenheit. Tidus: I'm telling you, [Yuna] won't die! / Cid: ...Boy, don't forget those words, 'cause if you do...I'm gonna make you regret it. / Tidus: I won't. So you know where she is? / Cid: 'Course not! That's why we're gonna look! Using this airship! ^ Square Co (December 20, 2001). Final Fantasy X. PlayStation 2. Square EA. Level/area: Fahrenheit (en route to Bevelle). Lulu: The palace of St. Bevelle. Heart of Yevon. [...] Rikku: What's Seymour doing alive? Didn't we...take care of him in Macalania? / Auron: He is dead. As dead as Jyscal was. His attachment to this world kept him from the next. [...] Yuna must be trying to send him. ^ Square Co (December 20, 2001). Final Fantasy X. PlayStation 2. Square EA. Level/area: Bevelle. Seymour: You would play at marriage just for a chance to send me? Your resolve is admirable. All the more fitting to be my lovely wife. ^ Square Co (December 20, 2001). Final Fantasy X. PlayStation 2. Square EA. Level/area: Bevelle. Tidus: Lemme go! I'm gonna kill that Seymour! / Kimahri: Yuna said leave! We leave! / Lulu: We'll join up with her later! ^ Square Co (December 20, 2001). Final Fantasy X. PlayStation 2. Square EA. Tidus [voiceover]: We escaped with our skins intact, but Yuna lost something. I could tell: her faith was shaken. Yevon had betrayed her. I felt like I should do or say something – anything – but nothing came. ^ a b Square Co (December 20, 2001). Final Fantasy X. PlayStation 2. Square EA. Level/area: Dream Zanarkand. Fayth: Yes, you're a dream of the fayth. You, your father, your mother, everyone. All dreams. And if the fayth stop dreaming... [...] Tidus: No! So what if I'm a dream? I...I like being here. / Fayth: We've been dreaming so long...we're tired. Would you and your father... Would you let us rest? ^ a b Square Co (December 20, 2001). Final Fantasy X. PlayStation 2. Square EA. Level/area: Dream Zanarkand. Fayth: Long ago, there was a war. [...] A war between Zanarkand and Bevelle. Bevelle's machina assured their victory from the start. Spira had never seen such power. The summoners of Zanarkand didn't stand a chance. Zanarkand was doomed to oblivion. That's why we tried to save it—if only in a memory. ^ Studio BentStuff, ed. (2001). Final Fantasy X Ultimania Ω (in Japanese). DigiCube. p. 84. ISBN 4-88787-021-3. ^ a b Square Co (December 20, 2001). Final Fantasy X. PlayStation 2. Square EA. Level/area: Bevelle Temple. Fayth: If you defeat Yu Yevon, it will end. Tell me, what do you know about Yu Yevon? / Tidus: He's what makes Sin come back! / Yuna: Sin is his armor. It protects him. / Fayth: Yu Yevon was once a summoner, long ago. He was peerless. Yet now he lives for one purpose: only to summon. [...] Even if you defeat[ed] Sin with the Final Summoning, Yu Yevon will live. Yu Yevon will join with the Final Aeon. He will transform it into a new Sin. / Yuna: Yu Yevon merges with the aeon... / Fayth: Then, protected by this new Sin he has created, Yu Yevon continues the summoning. ^ Studio BentStuff, ed. (2001). Final Fantasy X Ultimania Ω (in Japanese). DigiCube. p. 82. ISBN 4-88787-021-3. ^ Square Co (December 20, 2001). Final Fantasy X. PlayStation 2. Square EA. Level/area: Zanarkand. Tidus: I give up. So, what would an adult do, then? They know they can just throw away a summoner, then they can do whatever they like. You're right. I might not even have a chance. But no way am I gonna just stand here and let Yuna go. And what Auron said about there being a way...I think it's true. [...] I'll go ask Yunalesca. She's got to know something. / Rikku: You really think she'll help you? / Tidus: I don't know, but I have to try. This is my story. It'll go the way I want it...or I'll end it here. ^ Square Co (December 20, 2001). Final Fantasy X. PlayStation 2. Square EA. Level/area: Zanarkand. Yunalesca: If I die, so does the Final Aeon. And with it...Spira's only hope. / Tidus: Then we'll find Spira a new hope! ^ Square Co (December 20, 2001). Final Fantasy X. PlayStation 2. Square EA. Level/area: Sin. Seymour: Sin has chosen me. I am part of Sin! I am one with Sin, forever! Immortal! / Tidus: Sin just absorbed you. / Seymour: I will learn to control it, from within. I have all the time in the world! Since you were gracious enough to dispose of Yunalesca...the only means of destroying Sin is forever gone! Now nothing can stop us! ^ Square Co (December 20, 2001). Final Fantasy X. PlayStation 2. Square EA. Level/area: Sin. Jecht: Well, I am Sin, you know. [...] / Tidus: That's enough! Let's finish this, okay? / Jecht: You're right. Well, then...let's go! [transforms into Braska's Final Aeon] / Tidus: I promise this'll be quick! Hit me with all you got, Dad! ^ Square Co (December 20, 2001). Final Fantasy X. PlayStation 2. Square EA. Level/area: Sin. Tidus: What I'm trying to say is...after we beat Yu Yevon, I'll disappear! ^ Square Co (December 20, 2001). Final Fantasy X. PlayStation 2. Square EA. Level/area: Celsius. Auron: I am also an unsent. You are not surprised? / Tidus: I think...I kinda knew. It was Yunalesca, wasn't it? ^ Square Co (December 20, 2001). Final Fantasy X. PlayStation 2. Square EA. Tidus: Yuna, I have to go. I'm sorry I couldn't show you Zanarkand. Goodbye. / Wakka: Hey! / Rikku: We're gonna see you again...? [...] / Yuna: [to Tidus] I love you. ^ Long, Andrew. "Financial Fantasy X". RPGamer. Archived from the original on February 6, 2009. Retrieved November 21, 2008. ^ "Interview: Final Fantasy X". Core Magazine. March 6, 2001. Archived from the original on April 13, 2001. ^ "Interview with Final Fantasy X Developers". The Madman's Cafe. January 19, 2001. Archived from the original on September 27, 2013. Retrieved April 14, 2013. ^ a b Studio BentStuff. Final Fantasy X Ultimania Omega (in Japanese). Square Enix. pp. 191–193, 476. ^ Square (December 17, 2001). Final Fantasy X. PlayStation 2. Square. Scene: staff credits. ^ a b c Minkley, Johnny (April 15, 2002). "Interview: Square invades London". Computer and Video Games. Archived from the original on April 14, 2013. Retrieved April 14, 2013. ^ a b c Square (December 20, 2001). Final Fantasy X International. PlayStation 2. Square EA. Level/area: Beyond Final Fantasy: Event. ^ a b Square (December 20, 2001). Final Fantasy X International. PlayStation 2. Square EA. Level/area: Beyond Final Fantasy: Character. ^ "Final Fantasy 10: Kitase reveals the secrets of its success". Gamestm. February 27, 2014. Archived from the original on November 7, 2016. Retrieved March 3, 2014. ^ GameSpot Staff (November 30, 2001). "Final Fantasy X". GameSpot. CBS Interactive. Archived from the original on February 13, 2009. Retrieved November 23, 2008. ^ Mackey, Bob (August 1, 2016). "True Tales from Localization Hell". US Gamer. Archived from the original on August 1, 2016. Retrieved August 1, 2016. ^ a b Birlew, Dan (2001). Final Fantasy X Official Strategy Guide. BradyGames. p. 268. ISBN 0-7440-0140-4. ^ PSM Staff (February 2001). "Monitor: Final Fantasy X Goes Offline". PlayStation: The Official Magazine. Future Publishing (42): 18. ^ Avistetto, Jimmy. "Final Fantasy X Not Online-Capable". RPGamer. Archived from the original on February 6, 2009. Retrieved November 23, 2008. ^ Square (December 20, 2001). Final Fantasy X International. PlayStation 2. Square EA. Level/area: Beyond Final Fantasy: Field. ^ a b c Square (December 20, 2001). Final Fantasy X International. PlayStation 2. Square EA. Level/area: Beyond Final Fantasy: Battle. ^ Birlew, Dan (2001). Final Fantasy X Official Strategy Guide. BradyGames. p. 266. ISBN 0-7440-0140-4. ^ "Behind The Scenes Of Final Fantasy X's Kiss Scene". Siliconera. March 16, 2015. Archived from the original on November 10, 2016. Retrieved August 10, 2016. ^ a b c Smith, David (December 18, 2001). "Final Fantasy X Review". IGN. News Corporation. Archived from the original on February 15, 2002. Retrieved November 23, 2008. ^ Huang, Michael. "Interview by RocketBaby.net". nobuouematsu.com. Archived from the original on February 6, 2013. Retrieved November 23, 2008. ^ Yukiyoshi Ike Sato (November 29, 2000). "FFX Theme Song Complete". GameSpot. CBS Interactive. Retrieved July 1, 2010. ^ Square (December 20, 2001). Final Fantasy X International. PlayStation 2. Square EA. Level/area: Beyond Final Fantasy: Music. ^ Rzeminski, Lucy. "Final Fantasy X Official Soundtrack". RPGFan. Archived from the original on April 11, 2008. Retrieved March 4, 2008. ^ "feel/Go dream ~ Yuna & Tidus". RPGFan. Archived from the original on April 9, 2008. Retrieved March 4, 2008. ^ Rzeminski, Lucy. "Final Fantasy X Vocal Collection". RPGFan. Archived from the original on April 16, 2008. Retrieved March 4, 2008. ^ Schnieder, Peer (May 11, 2005). "Dear Friends: Music from Final Fantasy". IGN. Archived from the original on March 22, 2007. Retrieved March 1, 2006. ^ "20020220 – Music from FINAL FANTASY". RPGFan. Archived from the original on January 20, 2013. Retrieved April 1, 2007. ^ "Distant Worlds – Music from Final Fantasy – Album Information". Square Enix Music Online. Archived from the original on April 9, 2012. Retrieved February 22, 2008. ^ "Album Information – Tour de Japon: Music from Final Fantasy DVD". Square Enix Music Online. Archived from the original on January 20, 2013. Retrieved February 22, 2008. ^ Rzeminski, Lucy (July 2, 2002). "Project Majestic Mix: A Tribute to Nobuo Uematsu – Gold Edition". RPGFan. Archived from the original on June 19, 2012. Retrieved August 13, 2008. ^ "Game: Final Fantasy X (PlayStation 2)". OverClocked ReMix. Archived from the original on March 2, 2008. Retrieved March 4, 2008. ^ Chronologist (July 19, 2001). "Final Fantasy X Ships, Includes FFXI Trailer". RPGFan. Archived from the original on February 6, 2009. Retrieved November 23, 2008. ^ a b Dunham, Jeremy (November 24, 2003). "Final Fantasy X-2 Developer Interview". IGN. News Corporation. Archived from the original on August 10, 2012. Retrieved November 24, 2008. ^ Calvert, Justin (September 10, 2003). "Final Fantasy X-2: Prologue for US and Europe". GameSpot. CBS Interactive. Archived from the original on February 13, 2009. Retrieved November 26, 2008. ^ Witham, Joseph. "Final Fantasy X International Europe Bound". RPGamer. Archived from the original on January 4, 2009. Retrieved November 23, 2008. ^ Gantayat, Anoop (July 1, 2005). "Square Enix Announces Ultimate Hits Collection". IGN. News Corporation. Archived from the original on January 13, 2009. Retrieved November 23, 2008. ^ "Final Fantasy X". Square Enix. Archived from the original on August 22, 2008. Retrieved November 27, 2008. ^ IGN Staff (August 20, 2001). "Final Fantasy X Ultimania Guide". IGN. Archived from the original on August 6, 2011. Retrieved November 26, 2008. ^ "Final Fantasy X HD Remake Coming to Vita and PS3". IGN. News Corporation. September 13, 2011. Archived from the original on September 23, 2011. Retrieved September 13, 2011. ^ Yip, Spencer (January 2, 2012). "Report: Final Fantasy X HD In "Early Development"". Siliconera. Archived from the original on January 4, 2012. Retrieved January 3, 2012. ^ "Check Out Final Fantasy X: HD Version for the PS Vita". Kotaku.com. Archived from the original on July 29, 2013. Retrieved July 16, 2013. ^ "Final Fantasy X/X-2 HD Remaster". Archived from the original on March 27, 2013. Retrieved March 23, 2013. ^ Ishaan (March 20, 2013). "Yes, Final Fantasy X-2 Is Getting An HD Remaster, Too". Siliconera.com. Archived from the original on March 22, 2013. Retrieved March 21, 2013. ^ "Final Fantasy X | X-2 HD Remaster". Finalfantasyxhd.com. Archived from the original on July 14, 2013. Retrieved July 16, 2013. ^ Kubba, Sinan (November 18, 2013). "Final Fantasy X/X-2 HD Remaster pushed back to March 2014". Joystiq. Archived from the original on November 19, 2013. Retrieved November 18, 2013. ^ Ishaan (December 11, 2014). "Final Fantasy X/X-2 HD Remaster Announced For PlayStation 4". Siliconera. Archived from the original on June 24, 2016. Retrieved June 8, 2016. ^ Scammell, David (2015-03-03). "Final Fantasy X/X-2 HD Remaster comes to PS4 in May". Video Gamer.com. Archived from the original on August 3, 2016. Retrieved 2016-06-08. ^ Schreier, Jason (May 10, 2016). "Final Fantasy X Pops Up On Steam". Kotaku. Archived from the original on May 11, 2016. Retrieved May 10, 2016. ^ a b Edge February 2002; issue 107. Future plc. 2002. pp. 76–77. ^ "SquareSoft". Edge Reviews Database. Edge. Archived from the original on August 13, 2011. Retrieved August 14, 2011. ^ プレイステーション2 – ファイナルファンタジーX. Weekly Famitsu. No.915 Pt.2. Pg.63. June 30, 2006. ^ "Final Fantasy – famitsu Scores Archive". Famitsu Scores Archive. Archived from the original on July 14, 2008. Retrieved July 16, 2008. ^ a b c Weigand, Mike (December 14, 2001). "GamePro: Final Fantasy X". GamePro. Archived from the original on September 27, 2010. Retrieved July 13, 2010. ^ a b c Liu, Johnny (December 1, 2001). "GameRevolution: Final Fantasy X". Game Revolution. Atomic Online. Archived from the original on November 2, 2009. Retrieved July 13, 2010. ^ a b Leeper, Justin. "Final Fantasy X". Game Informer. Archived from the original on February 24, 2005. Retrieved November 23, 2008. ^ a b Kasavin, Greg (December 14, 2001). "Final Fantasy X Review". GameSpot. CBS Interactive. Archived from the original on February 12, 2009. Retrieved November 23, 2008. ^ a b "Final Fantasy X (ps2: 2001): Reviews". Metacritic. CBS Interactive. Archived from the original on September 17, 2008. Retrieved November 23, 2008. ^ a b "最優秀賞は「FF10」!! 「第6回 CESA GAME AWARDS」授賞式". GPARA.COM. Archived from the original on August 26, 2011. Retrieved May 28, 2009. ^ "The History of Final Fantasy". GameSpot. Archived from the original on June 6, 2004. Retrieved June 11, 2012. ^ IGN Staff (July 19, 2001). "Final Fantasy X Sells Like Crazy; World Not Shocked". IGN. News Corporation. Archived from the original on August 2, 2011. Retrieved November 24, 2008. ^ a b Craig Glenday, ed. (March 11, 2008). "Record Breaking Games: Role-Playing Games". Guinness World Records Gamer's Edition 2008. Guinness World Records. Guinness. pp. 156–167. ISBN 978-1-904994-21-3. ^ IGN Staff (July 24, 2001). "Final Fantasy X Approaches 2 Million Copies Sold". IGN. News Corporation. Archived from the original on December 8, 2008. Retrieved November 24, 2008. ^ IGN Staff (January 7, 2001). "FFX Tops Sales Charts". IGN. Archived from the original on February 6, 2009. Retrieved November 24, 2008. ^ Varanini, Giancarlo (January 30, 2002). "Final Fantasy X sales meet expectations". GameSpot. News Corporation. Archived from the original on February 5, 2009. Retrieved November 24, 2008. ^ Androvich, Mark (October 26, 2007). "PS2 celebrates 7th anniversary". Gamesindustry.biz. Archived from the original on February 5, 2009. Retrieved November 24, 2008. ^ "2001年ゲームソフト年間売上TOP300" [2001 Game Software Annual Sales Top 300]. Famitsū Gēmu Hakusho 2002 ファミ通ゲーム白書2002 [Famitsu Game Whitebook 2002] (in Japanese). Tokyo: Enterbrain. 2002. Archived from the original on June 27, 2015. ^ Calvert, Justin (January 20, 2004). "Final Fantasy X-2 sells a million". GameSpot. CBS Interactive. Archived from the original on December 7, 2008. Retrieved November 24, 2008. ^ "Final Fantasy X sales in October 2013". Square Enix Japan. October 10, 2013. Archived from the original on February 17, 2016. ^ a b IGN Staff (July 13, 2001). "Final Fantasy X Gets Rated in Japan". IGN. News Corporation. Archived from the original on September 17, 2008. Retrieved November 24, 2008. ^ "Final Fantasy X Reviews". Game Rankings. CBS Interactive. Archived from the original on January 11, 2009. Retrieved November 24, 2008. ^ "The Best and Worst of 2001". GameSpot. CBS Interactive. Archived from the original on February 3, 2002. Retrieved July 6, 2010. ^ Edge Staff (March 3, 2006). "Japan Votes on All Time Top 100". Edge. Archived from the original on August 14, 2011. Retrieved November 24, 2008. ^ IGN PlayStation Team (March 16, 2007). "The Top 25 PS2 Games of All Time". IGN. News Corporation. Archived from the original on February 28, 2009. Retrieved November 24, 2008. ^ "The Top 10 Best Looking PS2 Games of All Time". IGN. May 7, 2010. Archived from the original on June 29, 2010. Retrieved June 29, 2010. ^ "Top 25 PS2 Games". GameSpy. March 16, 2007. p. 6. Archived from the original on July 12, 2010. Retrieved July 5, 2010. ^ "The Top 10 Tuesday: Best Pre-Rendered Cutscenes". IGN. News Corporation. June 20, 2006. Archived from the original on June 29, 2011. Retrieved June 29, 2010. ^ "Readers' Picks Top 100 Games". IGN. News Corporation. June 20, 2006. Archived from the original on August 14, 2010. Retrieved June 29, 2010. ^ Kalata, Kurt (March 19, 2008). "A Japanese RPG Primer – Final Fantasy X". Gamasutra. p. 15. Archived from the original on March 3, 2016. Retrieved November 25, 2009. ^ "The Top 7... Best Final Fantasy games". GamesRadar. March 19, 2008. p. 2. Archived from the original on June 15, 2011. Retrieved July 5, 2010. ^ "Ranking the Final Fantasy Series". IGN. News Corporation. December 9, 2009. p. 1. Archived from the original on June 15, 2010. Retrieved July 5, 2010. ^ "AIAS ANNUAL AWARDS > 6TH ANNUAL AWARDS". Academy of Interactive Arts & Sciences. Archived from the original on October 23, 2010. Retrieved November 19, 2008. ^ "BEST OF 2001: Overall Game of the Year". GameFaqs. Archived from the original on December 19, 2011. Retrieved January 6, 2012. ^ "Great Loves – Features at GameSpot". GameSpot. CBS Interactive. February 14, 2006. Archived from the original on May 18, 2007. Retrieved March 13, 2008. ^ Studio BentStuff, ed. (2001). Final Fantasy X Ultimania Ω (in Japanese). DigiCube. p. 191. ISBN 4-88787-021-3. ^ Sato (December 26, 2013). "Final Fantasy X Scenario Writer On The Possibility Of Final Fantasy X-3". Siliconera. Archived from the original on December 27, 2013. Retrieved December 26, 2013. ^ Schreier, Jason. "The Makers Of Final Fantasy XIV Are Still Deciding How To Add Blitzball". Kotaku. Retrieved 2017-07-22. ^ "Final Fantasy Retrospective Part VII". GameTrailers. August 28, 2007. Archived from the original on May 25, 2009. Retrieved April 6, 2009. ^ "Final Fantasy Brand Manager Talks Possibilities For Final Fantasy XVI And X-3". Siliconera. 9 November 2016. Archived from the original on 10 November 2016. Retrieved 9 November 2016. ^ "Dissidia Final Fantasy NT Out Today". Blog PlayStation. January 30, 2018. Retrieved August 28, 2018. ^ "Square Enix's Yoshinori Kitase comments on a possible Final Fantasy X-3". Nintendo Everything. December 13, 2018. Retrieved December 13, 2018. 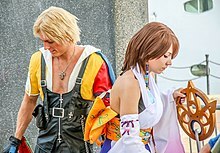 Wikimedia Commons has media related to Final Fantasy X.